A long time ago [Brother Handro: “in a galaxy far, far away...” ] , towards the end of my first stint as a wargamer, a game was released called Inquisitor. This game was great, but complicated. A dedicated RPG for the 40K universe its legacy can almost be seen in games like Kill Team. It took the universe we knew from 40k and the ideas of gang progression with stats increases, from old favourites like Necromunda, and boosted them to true RPG depths. Players took their gang of 3-5 models and, with the help of a DM, fought short narrative battles along a campaign. The rules were complicated but 40k standards [Der H: “It makes 7th Ed look simple!”] nd not many people I knew played it. d100 and percentage rolls, coupled with an action system took some getting used to. The models were stunning, simply stunning, with 54mm giving a range of detail not seen before by many. There were, of cours, problems. The slim number of models available made conversions trickier [Der H: “although A) the rulebook had several colour pages demonstrating easy swaps and B) I swapped Dante’s inferno pistol to replace Eisenhorn's left hand and it still looked too big!” rother Handro: “28mm Heroic scale for the win!”] nd some of the rules were easy to overuse - Space Marines tended to ROFL-Stomp most characters and there was even an article discussing if Astartes should even be allowed! 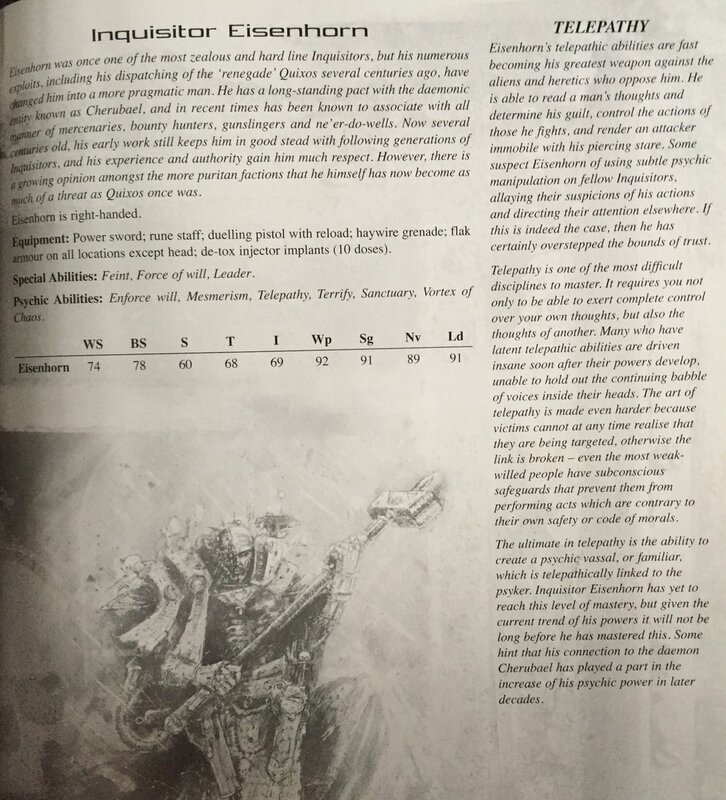 may pontificate more on the merits of Inquisitor, as well as such delights of Inqusi-munda, Inq28 and anything with Blanchian influence another time, but today I want to talk about Eisenhorn! Eisenhorn’s artwork in Inquisitor was amazing, and the stories behind the character fascinating. The model was a favourite in Inquisitor 54mm, Typus’ power armour and Covenant’s carapace armour were probably more useful to the wearer, but the swept pose was great. My model was canabalised to make the left hand an inferno pistol, his right a daemon sword, and the roll on his back into scrolls. My Inquisitor was born and, with daemon host, mutant and tech priest beside him, he wrecked face...until my Artemis conversion just flayed his face off with his gauss blaster....Deathwatch FTW baby! When I saw that Eisenhorn was being released as a limited run, 28mm model, I was there! Missing the first orders I resorted to the guys at Element Games who, as always, saved my bacon! I finally had time to pick him up today and so here we are! Little booklet with assembly guide and other things . This model, isn’t it lovely! Finecast generally gets a very bad rep (possibly for good reason! ), but this seems perfect. The head, hands and even feet are separate but the holes seem too small for my current magnets [Brother Handro: “why always magnets! ?” ]. I plan on pinning/magnetising the head and hands, but having this classic usable as Eisenhorn himself, or as my old Inquisitor should I do desire! Check back soon for some progress as well as some possible conversion opportunities!